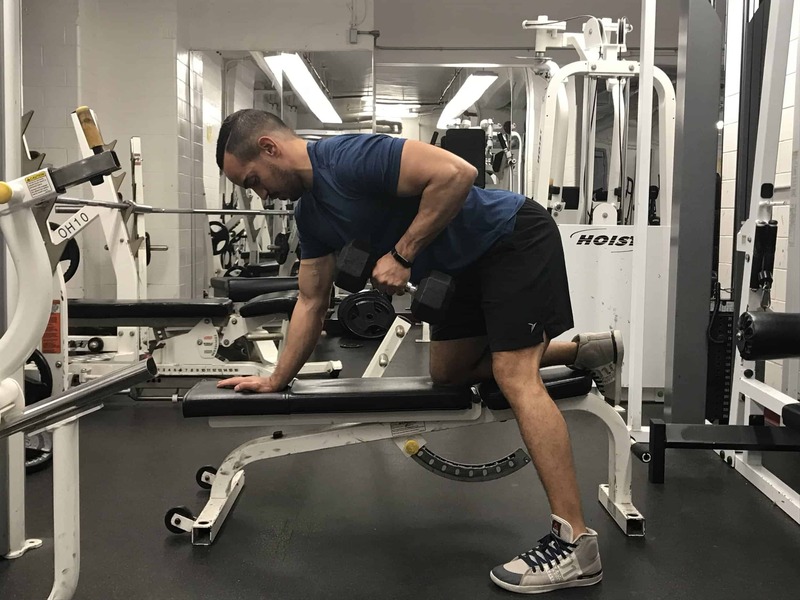 The bent over one arm dumbbell row is one of the most basic yet fundamental exercises in the fitness library. 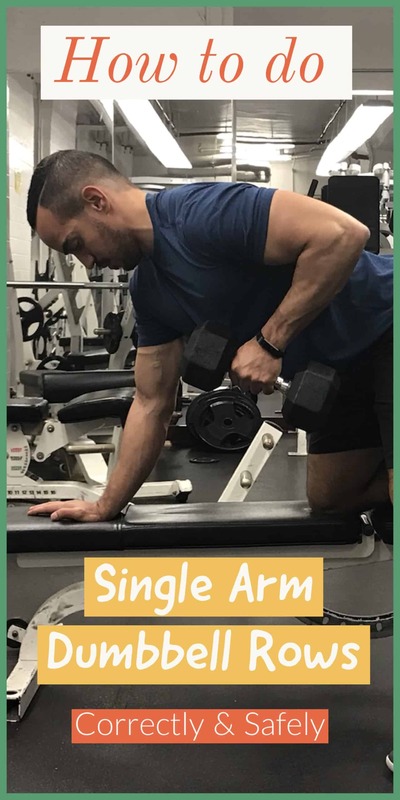 The dumbbell row strengthens numerous muscle groups including the posterior shoulder, the upper back, and the latissimus dorsi. As simple as this exercise is, many people perform it incorrectly. Today’s post will go over the proper way to perform the dumbbell row, and mistakes to avoid. When reversing the movement, do not let your shoulder blade protract all of the way down. Keep some level retraction in your scapula at all times. If you do not have a bench to use as support, simply place your outstretched hand on a sturdy surface. Assume a shoulder width stance with your feet in line with each other, not a staggered stance. Keep your back flat, your neck neutral and your focus on your lats and scapula. When the weight starts to get heavy, it is inevitable to use a little momentum. With that said it’s really easy to get carried away. If your back is excessively rotating, or you need a lot of momentum to initiate the movement, then the weight is too heavy. Again, it is important to use your lats and your scapula to bring the weight up, and not your biceps. If you don’t actively focus on using your back muscles, then you are wasting your time. If done correctly, the weight should not travel a very long distance. This is a common problem. The dumbbell row is for the back, not your biceps. If you only feel this exercise in your arms, then you are performing it incorrectly. Squeeze your lats, bring your elbow to the ceiling, and retract your scapula. You bicep will inevitably be involved in the movement, but you should also feel your back muscles working. DO I NEED TO DUMBBELL ROWS ON A BENCH? The bench is the easiest way to perform the dumbbell row exercise, however it can be performed on any sturdy surface. Check out the dumbbell bent over row above. Another variation that you can perform is the Chest Supported Row. This exercise also requires a bench, but instead you lay flat on your chest while rowing the dumbbells up towards the bench. You can also choose to flare your elbow out 90 degrees rather than tucking it up towards the ceiling. 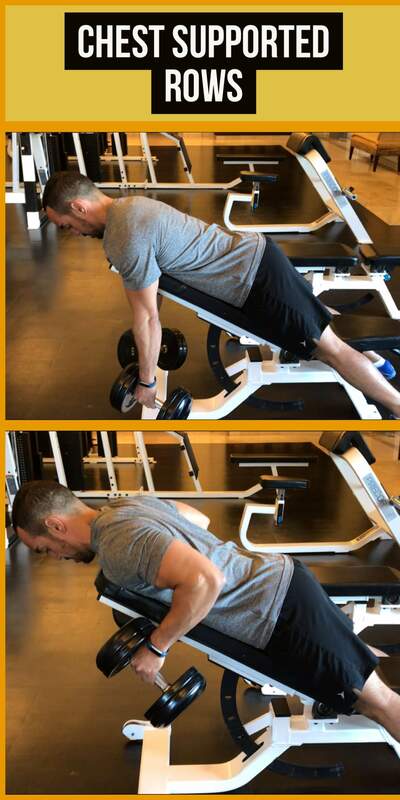 This dumbbell row variation will emphasize the posterior shoulder more. HOW CAN I INTEGRATE THE DUMBBELL ROW INTO MY TRAINING? Check out The WCT Best Workout Template For Busy Professionals to find a simple way to add the dumbbell row and other great exercises into your routine.